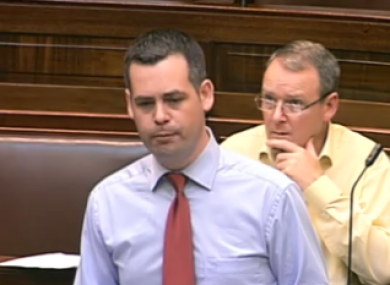 Pearse Doherty said one licensed lender charged interest rates of up to 210 per cent APR. THE GOVERNMENT has said it will oppose draft legislation tabled by Sinn Féin which proposed to place a limit on the interest rates that moneylenders are allowed to charge – saying it would threaten the viability of the sector. Legislation proposed by the party’s finance spokesman Pearse Doherty had sought to introduce a new limit of 40 per cent APR on any funds lent by a moneylender licensed under Irish law. Introducing the Bill, Doherty said that over 300,000 people were now in receipt of loans from Ireland’s 42 licensed moneylenders, which were not subject to any legal ceiling on the rates they could charge. This meant that some Irish lenders charged up to 210 per cent APR, he said – a rate which would mean a €500 loan would cost €186 if repaid within six months, or €375 if repaid over a year. 29 licensed Irish lenders, he added, charged APR of over 100 per cent – while 14 charged rates of over 150 per cent. Gerry Adams added that borrowing was “not for drink, not for luxuries, not for pleasure”, but instead to meet everyday bills, he said – arguing that a significant number of households now reliant on the services of moneylenders. Adams said Sinn Féin’s proposed limit of 40 per cent was fairer to customers, while also allowing licensed lenders to operate “on a sound commercial basis” and to remain viable themselves. Junior finance minister Brian Hayes, responding for the government, said the move would actually be regressive – as it would force legitimate moneylenders out of business and send them into the arms of unlicensed loan sharks. “The most likely impact of applying a capped rate of 40 per cent APR, or a lesser rate… is that moneylending would no longer be viable,” Hayes said, claiming that licensed moneylending was a “labour-intensive” and “inherently expensive business”. “Licence renewals would not be sought, and it would likely close down the industry,” he said. Hayes pointed to a 2009 study undertaken in the UK where it was concluded that a not-for-profit housing finance agency would need to be able to charge interest rates of close to 123 per cent APR in order to be commercially viable, assuming start-up capital of £18 million. 13 of the EU’s 27 member states have legal caps on the interest which can be charged by licensed lenders – with Spain having a cap of 10 per cent APR, while Belgium’s upper limit stands at 19.5 per cent and France’s at 21.6 per cent. Poll: Are you up to date with your bills? Email “Government will oppose SF bill to limit moneylenders' interest rates”. Feedback on “Government will oppose SF bill to limit moneylenders' interest rates”.